Make not thyself helpless in drinking in the beer shop. For will not the words of thy report repeated slip oft from thy mouth without thy knowing that thou hast uttered them? Falling down thy limbs will be broken, and no one will give thee a hand to help thee up. As for thy companions in the swilling of beer, they will get up and say, "Outside with this drunkard." from the invention of the automobile. Indeed, there is probably no traffic safety subject given more attention in the technical and popular literature than the role of alcohol. A review by the National Highway Traffic Safety Administration  cites over 550 technical articles relevant to alcohol and driving. Moskowitz and Robinson  identify 557 citations on the influence of alcohol on skills performance. The first of these three effects was unknown until recently. The basic new finding, which we discuss later, is that, other factors being equal, the same physical impact tends to produce more injury for higher levels of alcoholic consumption; this is counter to earlier conventional wisdom that, by relaxing the body, alcohol consumption reduced injury risk. Thus the old adage that God protects drunks and babies appears false; from the same impact, drunks and babies (as shown in Chapter 2) are both more likely to die. research on the effect of alcohol focuses on its effect on performance. Although its effect on behavior may be the more important factor in traffic safety, this factor is, in principle, extremely difficult to study in laboratory experiments. In this chapter we first discuss the measurement of alcohol use and intoxication, and then discuss the recent experiments which show that injury risk from the same impact increases with alcohol consumption. We then describe some laboratory experiments showing how alcohol affects performance. Rather than discussing the effect on behavior as such, we proceed directly to the influence on crash risk, which incorporates both performance and behavior influences. This background then sets the scene for estimates of how many crashes and fatalities would be prevented if alcohol were absent as a factor. alcohol, it is therefore crucial to indicate whether it is the proportion of the volume or the proportion of the mass that is indicated. Although alcoholic beverages come in a wide variety of forms, colors, flavors and bouquets, their chief constituents are water and alcohol. Other components appear to have only minor pharmacological significance in general [Wallgren and Barry 1970], although mold and other constituents in specific beverages may trigger allergic reactions in some individuals, while other ingredients may add to the severity of the hangover [Waller 1985, p. 512]. Most US beers contain about 4.5% alcohol by volume, with premium beers having 5.0%. Light beers can be as low as 3%, and low-alcohol beers around 2%. Alcohol content is not indicated on beer containers in the US; apparently manufacturers wanted to avoid using alcoholic content as a component in marketing and advertising because of concerns that such competition would lead to escalating alcoholic content. Canadian beers typically have 5.0% alcohol by volume. In Europe, alcohol content is indicated on some beer containers; 6% by volume is not uncommon; some lagers, referred to in the trade as "super strongs", have alcohol content as high as 9% by volume, which is higher than for some wines. The percent by volume of alcohol in wine and spirits is normally indicated directly on the label. Wines tend to be between about 8% to 14%, with the great majority being in the range from 11.5% to 13.8%. Fortified wines, like sherry and port, tend to be close to 20% alcohol by volume. Wine coolers are nearly all 4.0%, with a few at 5.0% or slightly higher. alcohol content is given in terms of "proof", which, in a strange sort of logic, indicates twice the percent alcohol content by volume. Proof originated in ignition tests to determine alcohol content. In Britain (and previously in Canada) the term proof is used, but with a different meaning than in the US. The UK proof is now defined to be directly proportional to the percent alcohol by volume, and therefore also to the US proof; specifically, US proof = UK proof X 8/7. Thus 80 US proof is equivalent to 70 UK proof. With increased integration with Europe, the British proof measure is gradually being replaced by the simple percent alcohol by volume, sometimes referred to in Europe as the Gay-Lussac system, after the French chemist who introduced it. Gins, whiskies and vodkas are typically about 40% alcohol by volume (80 proof in the US system), while liqueurs tend to be less, and in some cases much less. Fluid measure in the US is usually in terms of fluidounces, with the US fluidounce defined as 1/16 of a US pint, and the pint defined as 1/8 of a US gallon. The US gallon is legally defined as 231 X (2.54)3 mL (231 cubic inches). This gives that one fluidounce is equal to 29.574 mL. The Imperial, or British, fluidounce is 1/20 of 1/8 of an Imperial gallon, which is defined as the volume of ten pounds of water at 60 degrees Fahrenheit; one Imperial gallon is measured to be 1.20095 US gallons. Hence the British fluidounce is equal to 28.413 mL, sufficiently close to the US fluidounce that no distinction need be made for most practical purposes. alcohol, and, if consumed within similar time periods, produce fairly similar pharmacological effects. After consumption, alcohol is absorbed rapidly through the stomach and is distributed widely throughout the body, including the brain. The amount of alcohol in the body can be determined by analysis of the alcohol content of samples of blood or breath. (BAC) we use in this book. Since a typical value indicating intoxication is 1 part alcohol per 1000 parts blood, or 0.001, it is convenient to multiply by 100, and express the result in terms of a percent. Thus 1 part alcohol per 1000 parts blood (by mass) is represented as a BAC of 0.1%. Note that the definition of BAC is therefore simply the percent, by weight, of alcohol in the blood. It is technically correct to substitute weight for mass, because ratios of weights are identical to ratios of masses. Although a plethora of measures representing the amount of alcohol in the blood appear in the literature, these can essentially all be converted to BAC without numerical change (apart from moving the decimal), with, at most, an inconsequential error of a few percent. The present diverse units, many of which are repeatedly qualified by such reminders as w/w, w/v and v/v (the symbols indicating weight or volume), often pose barriers to understanding, even though they are conceptually and numerically closely related to the BAC definition above. In many countries (for example, Sweden, Norway, Finland, Denmark and West Germany), legal statutes are defined directly in terms of mass of alcohol per mass of blood [Jones 1988], which, when expressed as a percent, is identical to BAC as defined above. Other measures occur; for example, in order to obtain a more convenient numerical value than provided by g/mL, the unit grams per deciliter of blood (g/dL) is used (dL = L/10). A measurement of 0.1 g/dL is identical to 0.001 g/mL, which, as discussed above, is for all practical purposes the same as a BAC of 0.1%. The unit mg/g, indicating milligrams of alcohol per gram of blood, also appears. Although such nomenclature helps remind the reader that it is masses being compared, it violates the normal practice in science of cancelling identical items in numerator and denominator. Numerically, 1 mg/g is identical to a BAC of 0.1%. intrusive means. The earliest practical breath-alcohol measuring instrument, the "Drunkometer", was developed in 1938 by Rolla N. Harger. The best known breath-alcohol instrument, the "Breathalyzer", was invented in 1954 by Robert Borkenstein [Borkenstein 1985] and has been used extensively in Canada and in parts of the US [Jones 1987]. Breath alcohol is closely related to BAC, the conversion factor varying only slightly from individual to individual. A BAC level of 0.1% is approximately equivalent to 1 gram of alcohol per 2100 liters of breath [Jones 1988]. In Britain, the legal limit of alcohol in breath, adopted in 1983, is 35 mg of alcohol per 100 mL of breath, which corresponds to 0.08% BAC based on a conversion factor of 2300 [Walls and Brownlie 1985]. A breath measurement in g/L is converted to BAC in percent by multiplying by a factor in the range 210 to 230. There is no agreed definition of intoxication, nor any specific BAC threshold defining intoxication. Intoxicated, or "drunk", or a host of synonyms or near synonyms given in any large dictionary, indicate large changes in conduct associated with consuming alcoholic beverages. Legal prescriptions use a wide variety of terminology and criteria. "Impaired" is used to indicate effects which, while still observable, are less than those indicating intoxication. As alcohol effects increase gradually with increased consumption, there are no clear-cut boundaries between sober, impaired, and drunk; such designations necessarily embody arbitrary criteria. In summary, BAC is here defined simply as the percent, by weight, of alcohol in the blood. Not only is this measure the most convenient from a technical point of view, being independent of units of measurement, it is also a measure easily understandable by laymen, two advantages that support its universal use. As discussed by Donelson , the pharmacology of beverage alcohol is well understood in large measure because of its importance in traffic safety. When consumed, it is readily and rapidly absorbed from the stomach, especially from the small intestine, and does not have to be digested before entering the blood. Alcohol readily distributes throughout tissues and fluids of the body in a manner similar to that of water. Alcohol is eliminated from the body mostly through metabolism (enzymatic breakdown). A very small percentage of alcohol is excreted unchanged in breath, urine and sweat. After consumption, the amount present at a given time in body fluids, organs, and other tissues is determined by rates of absorption, distribution, and elimination. The rate of absorption depends on the quantity drunk, its concentration, and especially the other contents of the gastrointestinal tract [National Highway Traffic Safety Administration 1985]. Food in the tract delays absorption, so that the conventional wisdom that drinking on an empty stomach increases the rate of onset of intoxication is well founded. When alcohol is taken with a heavy meal, up to six hours may be required for complete absorption [Wallgren and Barry 1970]. of intoxication associated with different levels of concentration when the same amount of ethyl alcohol is consumed are minor compared to the main influences which are related to the actual amount of ethyl alcohol consumed, regardless of concentration [Waller 1985, p 511]. Fig. 7-1 shows a schematic representation of the absorption and elimination pattern that tends to be followed by most people, based on the pioneering studies conducted by Erik Windmark in Sweden in the 1920's and 1930's [Andreasson 1986]. The dependence of BAC on such factors as amount of alcohol consumed and body weight are expressed in what are referred to as Windmark laws. For example, the linear portion in Fig. 7-1 can be used to extrapolate a previous BAC level if measurements are available only some time after drinking has ended. ones for establishments selling alcoholic beverages, which provide estimates of BAC, or indications of whether BAC exceeds some limit [Voas 1988]. The behavioral and emotional effects of consuming alcohol arise from its effect on the brain. Measuring BAC is really an attempt to measure the amount of alcohol in the brain. The behavior changes associated with the same BAC vary from individual to individual, and different amounts of alcohol induce acute intoxication in different individuals. Relevant variables are body mass, body fat, stomach contents, speed of drinking, physical health, and the tolerance the individual has developed to alcohol [National Highway Traffic Safety Administration 1985]. BAC's as low as 0.02% to 0.03% affect the performance of some individuals. At BAC of 0.1%, about half of all people show signs of intoxication. Alcohol has a slightly greater effect on performance during the absorption phase than during the elimination phase. This is known as the "Mellanby" effect [Moskowitz, Daily, and Henderson 1979]. There may be residual effects on behavior also during "hangover" after all the alcohol has been eliminated from the system [Laurell and Tornros 1982]. influences human physiology and brain function. Although we lack unifying theories and predictive models, we still have a large and increasing body of empirical knowledge on alcohol's effects, some of which is described below. Until recently, it was generally believed that the presence of alcohol reduced the likelihood of injury, given an impact (or physical insult) of specific severity. This fitted a common notion that, by being more relaxed, drunks were more likely to "roll with the punches"; more importantly, it appeared to be supported in some clinical studies. In general, these studies monitored the progress of sets of "drunk" and "sober" patients admitted to hospitals with injuries of similar severity. It was generally observed that the drunks exhibited higher rates of recovery or survivability. It now appears that such studies are methodologicaly flawed [Waller 1987] in that the agent being studied, namely alcohol, played a crucial role in subject selection. If alcohol increases the probability of dying at the scene of a crash, then subjects whose injuries prove fatal because of alcohol use are excluded from the comparison in the hospital tests. Similarly, if being sober compared to being drunk were to reduce injury to below that requiring hospitalization, this would similarly negate any conclusions based exclusively on those admitted to hospital. Indeed, instead of examining how alcohol influences injury risk, such studies are examining secondary and unimportant details of the non-normalized distributions of injury versus recovery curves for drunk and sober drivers. crashes matched in a sufficient number of important characteristics that they could be judged to be of similar severity, using data on 1 126 507 drivers involved in 1979-1983 North Carolina crashes. Three major sets of analyses are conducted. The first two rely on the investigating police officer's judgment as a measure of alcohol involvement, two levels (not drinking, and drinking - impaired) being used; for deceased drivers these data were supplemented with medical examiner records. The third set of analyses is restricted to drivers with objective BAC measures. In the first set of analyses, the proportion of drivers killed is analyzed as a function of driver alcohol status while taking into account other factors associated with extent of injury. The second set uses various levels of injury as subjectively indicated by the police officer, thus yielding a much larger number of cases. The results of fitting log-linear models to the data indicate that, in all cases, injury risk was greater when alcohol was present. The results for the first analysis -- on the effect of alcohol on fatality risk, are shown in Fig. 7-3. The overall conclusion [Waller et al. 1986] is that the alcohol-impaired driver was 3.85 times as likely to die as the alcohol-free driver in crashes of comparable severity. Additional evidence that alcohol increases injury risk is provided by Anderson and Viano , and by Dischinger et al. , who find that an intoxicated person might be at greater risk of immediate death due to increased vulnerability to shock and therefore decreased time available for emergency medical intervention. The alcohol effect that traditionally has been considered most relevant to traffic safety is the influence on task performance. Inability to walk a straight line, or slurred speech, have long been interpreted to indicate intoxication. There has been much scientific investigation of how alcohol consumption affects human abilities to perform a variety of tasks. The basic experimental approach common to most of them is to obtain first some performance measure, such as reaction time, for a subject when alcohol-free. The subject is then administered a specified dose of alcohol, and after some appropriate delay to allow absorption, the performance is measured again. In this way variations in performance are measured as a function of alcohol use. When appropriate precautions are exercised, such experiments do not place subjects at risk, and consequently do not involve intractable ethical questions. Moskowitz and Robinson  identify 557 citations in the technical literature on the influence of alcohol on skills performance. They analyze the results of 159 of these, the criteria for a study to be included in their analysis being that it provides enough information to infer a BAC, and it finds alcohol effects on the performance of tasks judged relevant to the driving task. Most of the studies compared performance at some task at just one level of BAC with performance at zero BAC. Some of the studies used more than one level of BAC -- the average number of BAC levels per study is 1.9.
initiated differed as a function of behaviors. The results are shown graphically in Fig. 7.4. 1. Reaction time. Appeared to show more variability than other measures for reasons unknown. 2. Tracking. Fifteen of 28 tracking studies demonstrated impairment at 0.05% BAC. 3. Vigilance or concentrated attention. This appeared among the least sensitive variable, with no study showing impairment below 0.05% BAC. 4. Divided attention. Subjects performed multi-tasks which placed competing demands on their attention. Impairment is reported with BAC as low as 0.02%, with 60% of the studies reporting impairment at or below 0.05% BAC. 5. Information processing. It appeared that information processing skills are impaired at relatively low BAC, with 75% reporting impairment at or below 0.08. 6. Visual functions. These refer to functions likely to be tested by an optometrist in contrast to performance with more complex information processing. Results suggested that retinal functions are least likely to show alcohol impairment, whereas eye movement factors are quite sensitive at low BAC. 7. Perception. Twenty-one studies of perception included auditory functions, visual illusions, etc., and in general are not particularly sensitive to alcohol until 0.08% BAC. 0.05% BAC. Tasks which required skilled motor performance and coordination, including standing steadiness, are more likely to be impaired at lower BAC. 9. Driving. Twenty-two studies of driving simulator and on-the-road testing varied widely in results. The large body of literature summarized by Moskowitz and Robinson  shows unmistakably that a variety of performance measures show degradation with alcohol consumption, and that such degradation becomes clearly observable at relatively low levels of BAC, such as 0.04%. In contrast, twenty years earlier, effects had not been demonstrated at levels below about 0.1% BAC [US Department of Transportation 1968], a finding that contributed to the 0.1% BAC level being used to indicate intoxication in US traffic laws. As more research is conducted, it seems to me inevitable that impaired performance will be associated with ever decreasing levels of BAC for the reasons which follow. other hand, if the response increases strictly monotonically with BAC, and there is certainly no general theoretical or other argument why it should not, then more precise research using more subjects will identify lower and lower limits of impairment. If such a response dose curve were linear, then the performance degradation at a BAC of 0.02% would be half that at 0.04%, and at 0.01% half that at 0.02%, and so on. It should be stressed that, in the above, impairment means any demonstrated reduction in performance associated with alcohol, without regard to magnitude. Many factors in addition to alcohol are associated with reduced performance, including the aftermath of a poor night's sleep, fatigue, tension, stress, and growing a little older. Such differences pale in significance compared to differences between individuals; a somewhat inebriated sleep-deprived fatigued tense over-the-hill former professional tennis player will hit a ball a lot better than I can at my peak performance. Thus, although performance clearly degrades with the consumption of even small quantities of alcohol, the specific role of such effects in increasing crash risk are far from obvious. What is probably even more important than alcohol's effect on performance is alcohol's effect on behavior. the extent to which alcohol increases willingness to risk life, limb, and property in a traffic crash. Laboratory or closed-roadway tests in which subjects perform tasks that simulate risk, with relatively high probabilities of losing a few dollars or crashing into a soft traffic cone, are much more tests of performance risk-estimation capabilities than representations of the risks of real driving. 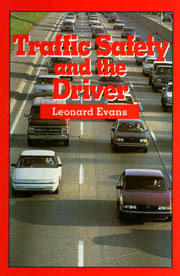 One of the most celebrated of such tests is that of Cohen, Dearnaley, and Hansel  who find that at very low BAC levels bus drivers were more willing to drive their vehicles through unacceptably small spaces, but at the same time were less able to drive successfully through adequate but difficult spaces; the driving errors did not, of course, actually damage the busses. There is modest evidence from real traffic that drivers with BAC in the range 0.08% to 0.15% may drive faster than drivers without alcohol [Damkot 1977]. House, Waller, and Stewart  also report higher speeds to be associated with alcohol use, but additionally find that as BAC increased to higher levels more crash-involved drivers were travelling at slower speeds. Although difficult to quantify in controlled tests, there is copious indirect evidence that alcohol has large effects on behaviors important in traffic safety. It is well recognized that alcohol increases aggressive behavior and general bravado. Its role in violence flows not from reduced skill, but from changed behavior. It seems to me that this is likewise its larger influence on traffic safety. However, the large quantity of traffic-crash data, which, as discussed below, show large influences of alcohol on traffic safety, still do not enable us to infer how much of the effect is due to mood alteration and behavior effects, and how much is due to performance degradation. discussed further here. However, it should still be kept in mind that drug use is probably of great importance in traffic safety. Doege  finds evidence in the literature suggesting that 1700 injury producing crashes and as many as 1500 fatalities may be due to drivers' illnesses or medical conditions other than alcohol intoxication, though he stresses that the methodology in many of the studies did not inspire confidence. Morris, MacKenzie, and Edelstein  report that preexisting chronic conditions, such as cirrhosis or heart disease, increase the risk that adult trauma patients will die. Popkin and Waller  report that drivers known by the North Carolina Division of Motor Vehicles to be undergoing treatment for epilepsy have crash rates 40% higher than the general driving public. Findley, Unverzagt, and Suratt  find that 29 patients with obstructive sleep apnea, which is associated with severe daytime sleepiness, have crash rates seven times greater than a control group of drivers. Seven of the 29 patients report falling asleep at least once a week while driving! Even without sleep disorders, drivers who have normal sleeping patters disrupted have increased fatal-crash risk [Hertz 1988; McDonald 1989]. three persons killed. Fourteen persons were injured, some seriously. A careful inquiry showed that in nineteen of these accidents the drivers had used spirits within an hour or more of the disaster. The other six drivers were all moderate drinkers, but it was not ascertained whether they had used spirits preceding the accident. The author of this communication shows very clearly that the management of automobile wagons is far more dangerous for men who drink than the driving of locomotives on steel rails. Inebriates and moderate drinkers are the most incapable of all persons to drive motor wagons. The general palsy and diminished power of control of both the reason and the senses are certain to invite disaster in every attempt to guide such wagons. performed again in the US, because, among other reasons, civil rights concerns make it increasingly difficult to obtain breath tests from the large numbers of randomly selected drivers comprising the control group. In the Borkenstein et al. study, which is also described in Borkenstein et al. , the control sample was obtained by police stopping vehicles at pre-selected sites and times, after which members of the research team requested a voluntary breath sample exclusively for research purposes. where A(i) and C(i) represent the number of crash-involved and control drivers, respectively. Some blurring of the distinction between these distinct concepts has contributed to a general sense that alcohol plays a less important role in multiple-vehicle crashes than it in fact does. The following (extremely hypothetical) construct illustrates the distinction between involvement and responsibility. Imagine a population of drivers who never crash. Now, let some very small fraction of these drivers consume a substance which makes them likely to crash into the next object they encounter, be it a tree or another vehicle. Examining a sample of drivers involved in single-vehicle crashes would find that 100% of them had consumed the substance; examining a sample of drivers involved in two-vehicle crashes would find that only about half of them had consumed the substance. The finding that 50% of drivers involved in the two-vehicle crashes had consumed the substance, compared to 100% for the single-vehicle crash drivers, does not imply any lesser responsibility of the substance for the two-vehicle crashes. For each case the substance is responsible for 100% of the crashes. 43, page 230, and Chart XV, the BAC levels of drivers judged to have been responsible for crashes. In Table 7-2 these data are shown divided into six BAC categories that will be used later. For expository convenience, the first category is designated BAC = 0, rather than the more strictly technically correct BAC < 0.001%. The additional space before BAC > 0.1% in Table 7-2 is to identify better those in violation of most US drunk driving laws. where the term "cause" is used for convenience and consistency with Borkenstein et al. while avoiding it in general for the reasons discussed in Chapter 4.
drivers who had consumed small amounts of alcohol were being unusually cautious to avoid attracting police attention. Note that, notwithstanding the sample of over 13 000 BAC measurements, there is still high uncertainty in some of the estimates of R because of sample size limitations. The data in Table 7-2 have been discussed in some detail because they are considered to reflect best how an individual driver's risk of causing a crash increases with increasing BAC, in contrast to crash involvement. These results are compared in Table 7-3 to derivations from a number of other case-control studies. Apart from the derivations from Borkenstein et al. , the other risk values are as provided by Reed . The table is structured so that as we move to the right, the causative contribution of alcohol may be presumed to decline. A large fraction of all fatal crashes are single-vehicle, so that a sample of fatally injured drivers will consist mainly of those responsible for the crash. The rightmost column is for all police-reported crashes, which are mainly two vehicle, so we expect lower values of r(i), in accord with the discussion above. Overall, there is fair agreement between all the studies, when sample size and varying interpretation are taken into account. The phenomenon being investigated, namely how crash risk depends on BAC, is not expected to vary much over the years, as it flows from the effects of alcohol on behavior and performance. A reduction in the amount of overall drinking should not affect the relationship, although it would make a larger sample size necessary to observe it to the same precision. The evidence (see also Hurst ) is very clear that crash-involvement risk increases steeply at high BAC levels. That is, for the sample of drivers in Grand Rapids, Michigan in 1962/3, and subject to the assumptions, especially the attribution of responsibility, 11.5% of the crashes were attributable to alcohol. keeping with the hypothetical construct at the beginning of this section when two-vehicle crashes are involved. This result can be useful in making approximate estimates when there is no way to assign responsibility -- simply do the calculation based on all the data and double; in fact, below we will multiply by the empirically determined ratio 11.5/6.3 = 1.8, rather than 2. An advantage of the calculation reflected in Eqns 7-5 and 7-6 is that it does not require the detailed breakdown of the data by BAC level, but just the total number of cases, and the numbers of these that were alcohol free. The above estimates referred to all crashes, which are overwhelmingly property damage only. In order to determine the fraction of losses at different injury levels we use data in Borkenstein et al. [1964, p. 232] showing drivers categorized by injury level and BAC. Quantities computed by applying Eqn 7-6 to these data do not estimate the fraction of injuries attributable to alcohol, because the data do not indicate whether the driver was responsible for the crash. The best estimate of that actual fraction attributable to alcohol is obtained by multiplying the value given in Eqn 7-6 by 1.8, in analogy with the case for all crashes. For all the crash severities, the overwhelming majority of crashes involve more than one vehicle, as is so for the case that generated the 1.8 factor. from year to year because BAC is not measured in any systematic nationwide way for all crash-involved drivers. The situation is different for fatal crashes, which is the subject of the next section. The availability of FARS data makes it possible to determine the fraction of all fatalities in the US that are attributable to alcohol, although, surprisingly, the literature did not contain even a moderately satisfactory estimate of this prior to 1990. The press often reports that alcohol is involved in about half of all fatal crashes. While true, this does not address what role alcohol plays. Undoubtedly coffee is involved in nearly all fatal crashes, yet eliminating coffee is unlikely to have much affect on traffic crashes. A widely quoted study performed under the auspices of the National Academy of Sciences [Reed 1981] estimated that eliminating alcohol would reduce traffic fatalities by 23.7%. The estimate described below [Evans 1990] uses FARS data from 26 states which recorded BAC for over 84% of fatally injured drivers. Because alcohol influences the number of fatalities in different ways depending on the types of crashes, it is necessary to treat separately single-vehicle crashes, two-vehicle crashes, and three- or more vehicle crashes, and to also consider fatalities to non-occupants of vehicles. The data used are shown in Table 7-5. Driver means a driver of any motorized vehicle; non-occupants are nearly all pedestrians. The analysis uses the risk factors in Table 7-2. Assume that F(i) drivers in BAC range i are killed in single-vehicle crashes. If these drivers had been at zero BAC, then a lesser number, namely F(i)/R(i), would have been killed. Summing this quantity over the six BAC categories gives the number of fatalities prevented by eliminating alcohol, and dividing this by the original number gives the fraction eliminated. Applying this calculation to the data in Table 7-5 gives the fraction of single-vehicle fatalities attributable to alcohol as 55.2%. Single-vehicle driver fatalities are overwhelmingly a nighttime phenomenon, as is clear from the data in Fig. 7-5 [Stein 1989]. This figure uses FARS data for 15 states with high levels of BAC reporting, and is for three years combined (1983, 1984 and 1985). killed in single-vehicle crashes died because of alcohol, many of the zero-BAC drivers killed in multiple vehicle crashes did. It is accordingly necessary to model the multiple-vehicle crash process to deduce the contribution of alcohol from the data in Table 7-5. This is done in Evans  by assuming that the number of crashes between drivers in the ith and jth BAC categories is proportional to the number of vehicles in the ith category times the risk factor for the ith category times the corresponding quantities for the jth category. Applying this model to the data in Table 7-5 gives that 45.0% of driver deaths in two-vehicle crashes are attributable to alcohol. The 45% consists of a 17.0% contribution from drivers with BAC = 0 and a 28.0% contribution from drivers with BAC > 0. The use of alcohol by other drivers increases the number zero-BAC drivers killed in two-vehicle crashes by 35%. An extension of the model to three-vehicle crashes gives that 43.8% of drivers killed in such crashes would not have died if alcohol had not been present. The same value is assumed to apply to the small numbers of drivers killed in crashes involving four or more vehicles. appropriate to consider drivers crashing into pedestrians at the same rate they crash into other vehicles. Such a calculation estimates that eliminating driver alcohol use would reduce pedestrian fatalities by 26%. However, this calculation ignores alcohol use by pedestrians, an assumption that the data in the last column of Table 7-5 unmistakably refute. Clearly, alcohol use by pedestrians contributes to pedestrian fatality risk, as has been shown in a case-control study by Blomberg and Fell . Further evidence is provided from Leeds, UK, where pedestrian alcohol use was a factor in 11% of pedestrian injury crashes [Carsten, Tight, and Southwell 1989], and from Irish data which indicate almost one in ten fatally injured drunk pedestrians appeared to have been lying on the roadway prior to being struck [An Foras Forbartha 1985]. The similarity of the distributions by alcohol use for pedestrians and drivers killed in two-vehicle crashes suggests that the fraction of pedestrian deaths attributed to alcohol is similar to the fraction for two-vehicle crashes, namely 45%, though it is more likely higher than lower than this value. 1989] which showed that in 1987 in the US 46.6% of fatally injured drivers had BAC > 0. The corresponding value for the 26 states is 48.9% (Table 7-5). The closeness of this to the fraction of fatalities attributable to alcohol suggests that a simple multiplicative factor should provide a satisfactory rescaling. Accordingly, all the estimates based on the 26 states are multiplied by 46.6/48.9 = 0.953 to generate the values shown in Table 7-6. Thus the fraction of US fatalities that would be prevented by eliminating alcohol is estimated to be 46.7%, or (47 + 4)% based on the error analysis in Evans . Eliminating alcohol in 1987 would therefore have prevented about 22 000 of the 46 386 fatalities. The estimate is based on assuming that if drivers with a given BAC level did not consume alcohol, they would drive at the same risk level as average drivers with BAC = 0 observed at similar places on similar occasions. Although there are clear indications that heavy users of alcohol differ from the general public in ways other than their alcohol use [Donovan, Marlatt, and Salzberg 1983; Stutker, Brantley, and Allain 1980], and that such differences could lead to different crash rates even when alcohol-free [McCord 1984], there does not appear to be sufficiently firm quantitative information to modify the above estimate. Any such effect would tend to lower the fatality reductions associated with eliminating alcohol. higher than the values in Table 7-6 for such crashes. A higher value is to be expected in the Stein  data because it refers to an earlier period (1983 - 1985) when alcohol played a larger role (as discussed later). The 47% fatality reduction is calculated by comparing the population of drivers with their current levels of BAC and associated risks, R, to an assumed population in which R = 1.0 for every driver. The calculation is repeated [Evans 1990] assuming that high BAC drivers reduce their risks not to R = 1.0, but to the level corresponding to the highest alcohol category still legal in most (but not all) US states, namely 0.05% to 0.099%, for which R = 2.98 (Table 7-2). Decreasing all R values higher than 2.98 to 2.98 rather than decreasing all R values to 1.0 leads to an overall reduction in fatalities of 41%. That is, all drivers with illegal levels of BAC acquiring a distribution of BAC similar to that presently observed for drivers with BAC between 0.050% and 0.099% reduces traffic fatalities by 41%. Setting the maximum risk level at other values generates the following percent declines in fatalities: 44% for a maximum risk of 1.5; 39% for a maximum risk of 3; 34% for a maximum risk of 6; 26% for a maximum risk of 10. The results of Borkenstein et al. suggest that a driver at 0.10% BAC has a risk of causing a crash about 6 times that of a zero BAC driver, suggesting that if all legally drunk drivers changed to marginally legal levels of just under 0.10% BAC, traffic fatalities would decline by 34%. The simple multiplicative approach used to extrapolate from the 26 states to the US can be used also to monitor changes in the role of alcohol in traffic fatalities. The previously mentioned discriminant analysis applied to 1982 FARS data shows 53.1% of fatally injured drivers had BAC > 0 (compared to 46.6% in 1987). From these data Evans  estimates that eliminating alcohol would have prevented 53.2% of 1982 fatalities compared to 46.7% of 1987 fatalities. Hence, in 1982, alcohol increased fatalities to 2.14 times the zero-alcohol number, compared to 1.88 in 1987, implying a reduction in fatalities of 0.26/2.14 = 12.1% from 1982 to 1987 attributable to reduced alcohol use. The decline in the crashes specifically attributable to alcohol (all minus those not attributable to alcohol), from 1.14 to 0.88, represents a 23% decline. The reduction, equivalent to 6400 fewer fatalities in 1987, helps explain why national fatalities did not increase during a time of economic expansion, as predicted by the multivariate model of Partyka . This reduction is much larger than the 2-3% decline that Hedlund et al. find associated with reduced alcohol involvement in an earlier period (1980 to 1982) before grass-roots activism became so prevalent. Any measure which reduces the fraction of fatalities attributable to alcohol from the 1987 value of 47% to, say, 42% (that is, a reduction of 10% in the 1987 value) is calculated to generate an overall fatality reduction of 8.6%. Approaches to reduce the magnitude of the contribution of alcohol to traffic losses form the subject of the next chapter. The psychological effects of alcohol are related strongly to the amount of alcohol (ethyl alcohol, or ethanol) present in the body, which can be measured conveniently from samples of blood or breath. Alcohol content in the body is expressed in terms of Blood Alcohol Concentration, or BAC, defined as the percent, by weight, of alcohol in the blood. As BAC increases, the likelihood of injury or death from the same impact blow increases, performance at a whole range of tasks deteriorates, and behavior (mood, aggression, bravado, risk-taking, etc.) changes. There are wide differences between individuals. Traffic crash risk increases steeply with increasing BAC, though it is not possible to determine how much of this is due to degraded performance and how much to changed behavior. Alcohol contributes importantly to traffic crashes, with its contribution increasing as crash severity increases. About 10% of property damage, 20% of injuries and 47% of fatalities from traffic crashes are attributable to alcohol. Alcohol is therefore, by a huge margin, the largest single factor contributing to traffic-crash losses. The reductions in traffic crash losses from reducing crashes attributable to alcohol far exceed reductions from any other potential countermeasure. Allsop R.E. Alcohol and road accidents. Report no. 6. Crowthorne, Berkshire, UK: Transport and Road Research Laboratory; 1966. An Foras Forbartha. Road accident facts Ireland, 1984. Dublin, Ireland: National Institute for Physical Planning and Construction Research; 1985. Anderson, T.E. ; Viano, D.C. Effect of acute alcohol intoxication on injury tolerance and outcome. In: Noordzij, P,; Roszbach, R., editors. Alcohol, drugs and traffic safety - T86. Amsterdam, Netherlands: Excerpta Medical Elsevier Science Publisher; 1987:251-254. Andreasson, R. Windmark's micromethod and Swedish legislation on alcohol and traffic. Stockholm, Sweden: The Information Center for Traffic Safety; 1986. Blomberg, R.D. ; Fell, J.C. A comparison of alcohol involvement in pedestrians and pedestrian casualties. American Association for Automotive Medicine, 23rd Annual Proceedings, Louisville, KY, p. 1-17; 3-6 October 1979. Borkenstein, R.F. Historical perspective: North American traditional and experimental response. Journal of Studies on Alcohol Supplement 10:3-12; 1985. Borkenstein, R.F. ; Crowther, R.F. ; Shumate, R.P. ; Ziel, W.B. ; Zylman, R. The role of the drinking driver in traffic accidents. Department of Police Administration, Indiana University; 1964. Borkenstein, R.F. ; Crowther, R.F. ; Shumate, R.P. ; Ziel, W.B. ; Zylman, R. The role of the drinking driver in traffic accidents. Blutalkohol 11 (supplement 1); 1974. Buttigliere, M., Brunse, A.J. ; Case, H.W. Effect of alcohol and drugs on driving behavior. In: T.W. Forbes, editor. Human factors in highway traffic safety research, p. 303-330. New York, NY: Wiley; 1972. Cohen, J; Dearnaley, E.J. ; Hansel, C.E.M. The risk taken in driving under the influence of alcohol. British Medical Journal, p. 1438-1442; 21 June 1958. Damkot, D.K. On-the-road driving behavior and breath alcohol concentration. Washington, DC: National Highway Traffic Safety Administration, report DOT-HS-802-264; 1977. Dischinger, P.C. ; Soderstrom, C.A. ; Shankar, B.S. ; Cowley, R.A.; Smialek, J.E. The relationship between use of alcohol and place of death in vehicular fatalities. Association for the Advancement of Automotive Medicine, 32nd Annual Proceedings, Seattle, WA, p. 299-311; 12-14 September 1988. Doege, T.C. Illness and crashes -- is there a relationship? Journal of Safety Research 19:145-150; 1988. Donelson, A.C. The alcohol-crash problem. In: Laurence, M.D. ; Snortum, J.R.; Zimring, F.E., editors. Social control of the drinking driver. Chicago, IL: University of Chicago Press, p. 3-40; 1988. Donelson, A.C.; Beirness, D.J. ; Hass, G.C. ; Walsh, P.J. The role of alcohol in fatal traffic crashes: British Columbia, 1985-1986. Ottawa, Canada: Traffic Injury Research Foundation of Canada; 1989. Donovan, D.M. ; Marlatt, G.A. ; Salzberg, P.M. Drinking behavior, personality factors and high-risk driving -- a review and theoretical formulation. Journal of Studies on Alcohol 44:395-428; 1983. Dubowski, K.M. Absorption, distribution and elimination of alcohol: highway safety aspects. Journal of Studies on Alcohol, supplement no. 10:98-108; July 1985. Evans, L. The why and how of the (metric) system of units. Human Factors Society Bulletin 21(4):3-5; 1978. Evans, L. The fraction of traffic fatalities attributable to alcohol. Accident Analysis and Prevention (in press) 1990. Farris, R.; Malone, T.B. ; Lilliefors, H. A comparison of alcohol involvement in exposed and injured drivers. Phases I and II. Washington, DC: National Highway Traffic Safety Administration, report DOT-HS-801-826; 1976. Fell, J.C.; Klein, J.M. The nature of the reduction in alcohol in U.S. fatal crashes. SAE paper 860038. Warrendale, PA: Society of Automotive Engineers; 1986. Fell, J.C.; Nash, C.E. The nature of the alcohol problem in U.S. fatal crashes. Health Education Quarterly 16:335-343; 1989. Findley, L.J. ; Unverzagt, M.E. ; Suratt, P.M. Automobile accidents involving patients with obstructive sleep apnea. American Review of Respiratory Diseases 138:337-340; 1988. Hedlund, J.; Arnold, R.; Cerrelli, E.; Partyka, S.; Hoxie, P.; Skinner, D. An assessment of the 1982 traffic fatality decrease. Accident Analysis and Prevention 16:247-261; 1984. Holcomb, R.L. Alcohol in relation to traffic accidents. Journal of the American Medical Association 111:1076-1085; 1938. House, E.G; Waller, P.F. ; Stewart, J.R. Blood alcohol level and injury in traffic crashes. American Association for Automotive Medicine, 26th Annual Proceedings, Ottawa, Ontario, p. 349-373; 1982. Hurst, P.M. Blood alcohol limits and deterrence: is there a rational basis for choice? Alcohol, Drugs and Driving. Abstracts and Reviews 1(1-2):121-130; 1985. Jones, A.W. History, present status and future prospects of breath-alcohol analysis. In: Noordzij, P.; Roszbach, R., editors. Alcohol, Drugs and Traffic Safety - T86. Amsterdam, Netherlands: Excerpta Medical Elsevier Science Publisher, p. 349-353; 1987. Jones, A.W. Enforcement of drink-driving laws by use of `per se' legal alcohol limits: blood and/or breath concentration as evidence of impairment. Alcohol, Drugs, and Driving 4:99-112; 1988. Klein, T.M. A method for estimating posterior BAC distributions for persons involved in fatal traffic accidents. Washington, DC: National Highway Traffic Safety Administration document DOT HS 807 094; July 1986. Laurell, H; Tornros, J. Hang-over effects of alcohol on driver performance. Linkoing, Sweden: National Road and Traffic Research Institute, VTI Report 222A; 1982. McCarroll, J.R.; Haddon, W., Jr. A controlled study of fatal automobile accidents in New York City. Journal of Chronic Diseases 15:811-826; 1962. McCord, J. Drunken drivers in longitudinal perspective. Journal of Studies on Alcohol 45:316-320; 1984. McDonald, N. Fatigue and driving. Alcohol, Drugs, and Driving 5:185-192; 1989. Moskowitz, H.; Daily, J.; Henderson, R. The Mellanby effect in moderate and heavy drinkers. In: Johnston, I.R., editor. 7th International Conference on Alcohol, Drugs and Traffic Safety, Melbourne, Australia; 23-28 January 1977. Canberra: Australian Publishing Service, p. 184-189; 1979. Moskowitz, H.; Robinson, C. Driving-related skills impairment at low blood alcohol levels. In: Noordzij, P.; Roszbach, R., editors. Alcohol, Drugs and Traffic Safety - T86. Amsterdam, Netherlands: Excerpta Medical Elsevier Science Publisher, p. 79-86; 1987. Morris, J.A. ; MacKenzie, E.J. ; Edelstein, S.L. The effect of preexisting conditions on mortality in trauma patients. Journal of the American Medical Association 263:1942-1946; 1990. Perrine, M.W; Waller, J.A. ; Harris, L.S. Alcohol and highway safety: behavioral and medical aspects. Washington, DC: National Highway Traffic Safety Administration, report DOT-HS-800-599; 1971. Popkin, C.L. ; Waller, P.F. Epilepsy and driving in North Carolina: an exploratory study. Accident Analysis and Prevention 21:389-393; 1989. Reed, D.S. Reducing the costs of drinking and driving. In: Moore, M.H. ; Gerstein, D.R., editors. Alcohol and public policy -- beyond the shadow of prohibition. Washington, DC: National Academy Press, p. 336-387; 1981. Simpson, H.M. The epidemiology of traffic injuries involving alcohol and other drugs. In: Noordzij, P.; Roszbach, R., editors. Alcohol, drugs and traffic safety - T86. Amsterdam, Netherlands: Excerpta Medical Elsevier Science Publisher, p. 87-96; 1987. Stein, S.K. Risk factors of sober and drunk drivers by time of day. Alcohol, Drugs, and Driving 5(3):215-227; 1989. Stutker, P.B. ; Brantley, P.J. ; Allain, A.N. MMPI response patterns and alcohol consumption in DUI offenders. Journal of Consulting and Clinical Psychology 48:350-355; 1980. US Department of Health, Education and Welfare: National Institute of Alcohol Abuse and Alcoholism. First special report to the US Congress on alcohol and health, from the Secretary of Health, Education and Welfare. Washington, DC: US Government Printing Office; 1971. U.S Department of Transportation. 1968 Alcohol and highway safety report. Report from the Secretary of Transportation to the US Congress, Washington, DC; 1968. Waller, J.A. Injury Control -- A guide to the causes and prevention of trauma. Lexington, MA: Lexington Books; 1985. Waller, J.A. Methodologic issues in hospital based injury research. American Association for Automotive Medicine, 31st Annual Proceedings, New Orleans, LA, p. 95-108; 28-30 September 1987. Waller, P.F. ; Stewart J.R.; Hansen, A.R. ; Stutts, J.C.; Popkin, C.L. ; Rodgman E.A. The potentiating effects of alcohol on driver injury. Journal of the American Medical Association 256:1461-1466; 1986. Wallgren, H.; Barry, H. Actions of alcohol. Amsterdam, Netherlands: Elsevier; 1970. Walls, H.J. ; Brownlie, A.R. Drink, drugs and driving, 2nd edition. London, UK: Sweet and Maxwell; 1985. Table 7-1 The form of data obtained from case-control studies to estimate the role of alcohol in crash-involvement. Table 7-2 Estimates of R(i) using data from Borkenstein et al. for drivers judged to have caused the crashes. R(i) is the risk that a driver in BAC range i causes a crash compared to the risk for a driver with BAC = 0. Table 7-3 Relative risk of driver involvement in various types of crashes as determined in case-control studies. * For BAC >= 0.15%. A. Drivers judged responsible for police reported crashes, Grand Rapids, Michigan, 1962-1963 (sample size of crash-involved drivers, N = 3305) [Borkenstein et al. 1964]. B. Drivers killed in crashes, Vermont, 1967-1968 (N = 106) [Perrine, Waller, and Harris 1971]. C. Drivers killed in crashes, New York, New York, 1959-1960 (N = 34) [McCarroll and Haddon 1962]. D. Drivers involved in injury-producing crashes, Huntsville, Alabama, 1974-1975 (N = 599) [Farris, Malone and Lilliefors 1976]. E. Drivers involved in crashes resulting in hospitalization, Evanston, Illinois, 1935-1938 (N = 270) [Holcomb 1938]. F. Drivers involved in police reported crashes, Grand Rapids, Michigan, 1962-1963 (N = 5985) [Borkenstein et al. 1964]. Table 7-4 Approximate estimates of the fraction of different types of crashes attributable to alcohol in 1961/1962 inferred from data of Borkenstein et al. .
Table 7-5. Distributions of Blood Alcohol Concentrations (BAC) of fatally injured persons in the 26 states* in 1987 FARS data with BAC known for over 84% of fatally injured drivers. All values, except those in the bottom row, are percents. From Evans . Table 7-6. Fraction of fatalities attributable to alcohol (based on 46 386 traffic fatalities in 1987). From Evans .